We are now shipping the first solid-state, Ultraviolet (UV) LED flashlights. This is an item that we manufacture here in the USA. You can't buy it anywhere else. Our UV penlight is the world's smallest, lowest priced-solid state UV light source. The pen is completely solid state using an ultra-efficient LED to generate the UV light unlike every product using a fluorescent tube or light bulb. 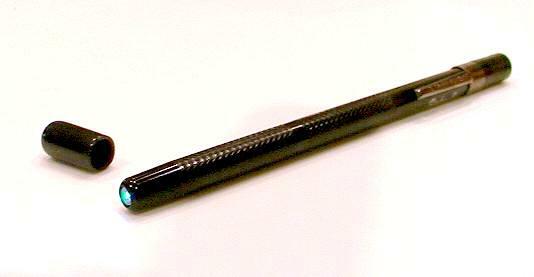 The penlight can slipped into a pocket, weighs very little and is much more durable than tubes or light bulbs. The battery life is much longer and the LED gives full UV light output for its entire longer life. No need for power cords, bulky battery packs and lots of expensive batteries! Our low price UV LED flashlight has many features and uses. The UV flashlight is compact, portable and rugged. The 370nm light emitted is UVA light, or longwave UV, which is inherently much safer than UVB or UVC. The 370nm light produced in just under the human eye visible light range. Click Here For Our Invisible UV Inks and Ink Pads. Document and forgery analysis: UV light can sometimes show alterations and erasures to documents. Alterations or changes will sometimes become directly visible when illuminated by UV light. UV light can also be used as an exciter source. Alterations sometimes emit IR light in response to a UV exciter source. Use the UV light in conjunction with a IR filter (such as our X-Nite 1000nm) and an IR sensitive camera. This technique is sometimes called IR fluorescence. Crowd and access control: Often access to events is controlled using an invisible mark on a hand or card that when illuminated with UV becomes visible (fluoresces). Instead of carrying around heavy and hot black lights, this UV LED penlight can be slipped into a pocket. Alkaline battery life is 70 hours. Readmission and beverage control codes can be quickly viewed with the UV light at nightclubs, amusement parks and controlled events. Crime scene inspection: Some bodily fluids will fluoresce under UV light. Some people even inspect their hotel sheets before use to see if the beds have been changed. Arson investigators use UV to search for the presence of accelerants. Currency and Bill verification: Many currencies contain a UV fluorescing strip. Leak detection: By adding a UV powder or liquid to a system with a leak and using a UV light source, leaks can be quickly found. Automotive repairmen often use UV leak detection systems for the repair of air conditioner leaks, oil leaks, sunroof leaks, cooling system leaks and oil leaks. Rodent detection: The urine of many animals, including cats and rodents will fluoresce under UV. Ultraviolet light itself is invisible to the human eye, but can cause materials such as rodent urine and hair to visibly fluoresce. For sanitation purposes, it is necessary to identify rodent presence in all areas of the food industry, from the large industrial plant to the small retail outlet. This is especially true in older establishments where construction and location make it more difficult to monitor rodent activity. To determine rodent presence, simply illuminate the area in question with a UV light. Dry rodent urine glows a blue-white if fresh to a yellow-white if old. Rodent hair glows blue-white and is easily identified on sacks or intermixed with food grains. UV Curing: UV light is used to cure many special epoxies and glues. Special adhesives require UV light to set up. This is usually accomplished using expensive, plug-in sources. Medical skin treatments: UV light is sometimes as a treatment for psoriasys, Lichen Planus, eczema, dandruff, and seborrheic dermatitis under a doctor's supervision. EPROM Erasure: EPROM stands for Electrically Programmable Read Only Memory. EPROM chips are widely used to store computer instructions. EPROM's contain a small window which when exposed to UV light erases the memory on the chip. Painting and Rug Repair Detection: Many modern inks, paints and dyes may look identical to old colorings under visible light. However, under UV, differences can be seen because the chemical composition of newer substances usually includes synthetic materials. Another example is the identification of natural versus synthetic blue diamonds. Although the UCD synthetic blue diamonds are visually identical to natural type IIb blue diamonds, they may be separated by the careful observation with a loupe or microscope, of inclusion features, color zoning characteristics, as well as graining and strain patterns, which are different between the two. Additionally, the fluorescent and phosphorescent reactions to UV light also provide a ready means to separate the two (in particular the short-wave ultraviolet light reactions). Please be aware that the visible light when in operation is less than 1% of the UV light being radiated. Most of the light generated by the device is invisible to the human eye but can easily cause damage to the eye.